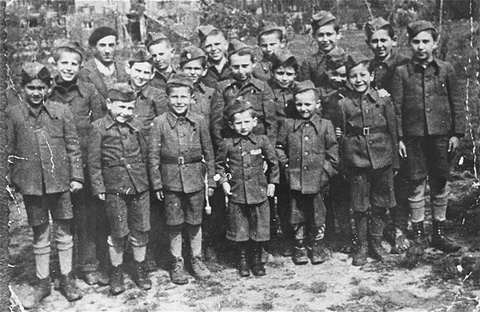 It’s hardly believable Elie Wiesel has not been taken to task for claiming he was the third boy on the left, while telling his French audience he was the fourth one. Compare the fresh-faced, very tall boy, who is the third on the left, with the alleged photo of Elie Wiesel in the barrack. Did Elie Wiesel EVER look like that? 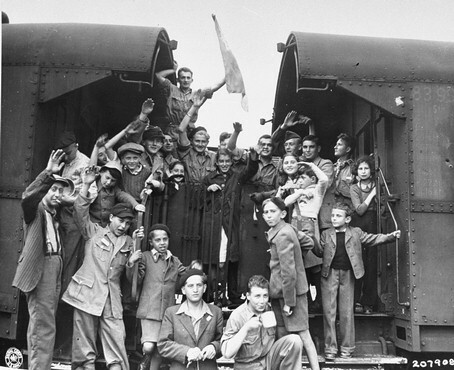 That boy is wearing a beret, which was the symbol worn by the Communist prisoners who ruled the Buchenwald camp. What about the young person on the far right in the front row? This person looks like a girl. re Joachim Neander is a pseudonym. He was “the voice of reason” at the RODOH forum before it was hijacked by The Holocaust Controversies crowd and then he left to join them there. Yes, he was critical of the Jewish soap legend, but he gave props to Tuvi Gutman (director of the laughable Monuments of Soap documentary) and ultimately propped what was left of it up with evidence he found indicating corpses were turning into to soap on their own in Nazi morgues in Poland. He was always waffling on Dr. Rasher and the Dachau gas chamber, too. Neander is a clever obfuscator not a genuine truth seeker. Thanks for this info, wdw. I had forgotten that his name was a pseudonym. The real Joachim Neander is a German church leader and hymn writer who was born in 1650 and died in 1680. Now, if you’re using a pseudonym, how can you call yourself Dr. and a PhD? I don’t think that’s kosher. Thanks very much for your portrayal of me vis a vis Prof. Ken Waltzer, furtherglory. I have been trying to make the time to write my continuation of the Elie in Buchenwald/Waltzer story; maybe this will spur me on. There is one correction I must make, however, in your quote from the article “What Happened to Waltzer’s book about the “boys of Buchenwald?” You quoted me correctly, but I had failed to change the line “none [no photographs] of him at the Ecouis School in France” after I discovered some photos of Elie Wiesel at the homes in France and published them … like here http://www.eliewieseltattoo.com/new-photo-of-elie-wiesel-in-france/ and here http://www.eliewieseltattoo.com/gigantic-fraud-carried-out-for-wiesel-nobel-prize/. I have just removed that line from the June 2011 article. But definitely there are no photos of Elie in any concentration camp, and he could have arrived at the homes in France (he was in several) via a different route. 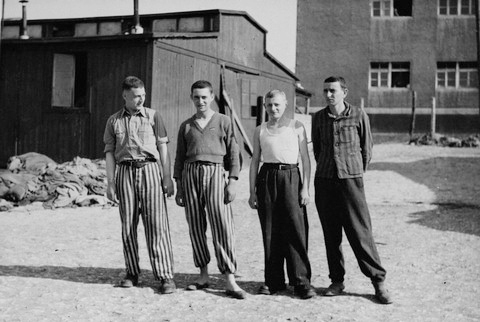 All the boys there were not from Buchenwald. I have made the correction on my blog post. Thank you FG! You are very kind. Have you ever read Joachim Neander’s article on Irene Zisblatt? It is a very interesting read, lots of documents cited and an absence of the usual heavy emotional content and hysterics towards holo-heretics (he is a gas chambers believer, but I know that at least one of the leading revisionists admits Neander is an excellent historian). Waltzer is mentioned several times, thanked for providing Neander with many documents concerning Zisblatt, and for proof reading the article. Neander basically concludes that Zisblatt is an Auschwitz survivor and deserves the usual sympathy for that, but she is also a compulsive liar. It’s seems strange that Waltzer, with all his holo-contacts, can’t get a half-decent historian to prove Wiesel’s case in the way Neander proved Zisblatt’s case. Perhaps he’s tried, but the results are just thought too damaging for publication. Thanks for the link. I know of the research done by Joachim Neander. I read his article and liked it very much. On the one hand, her story is overburdened – she does not leave out a single Nazi atrocity ever reported by survivors of the camps, ghettos, and Einsatzgruppen shootings. She, too, serves her audience with all common Holocaust stereotypes and myths. On the other hand, her description of the life at Auschwitz and, to a far greater extent, at Neuengamme, is astonishingly vague, and where details are given, the narration is frequently inconsistent or conflicts with the established historical facts. He is exactly right. She tried to put every “Nazi atrocity” into her book. This immediately arouses suspicion. Irene wrote about Majdanek. At the time that the camp was in existence, it was called by the German name Maidanek. The name was changed to the Polish spelling after the war. Another error that Neander didn’t catch. Interesting that you are promoting Joachim Neander’s article on Irene Zisblatt that was written for and posted at the Holocaust Controversies blog — that bunch of name-callers, dissemblers and hard-core exterminationists. You cooperate with them often, I have noticed. And who, pray tell, is the “leading revisionist who *admits* Neander is an excellent historian?” You obviously know who, but do not name him. Seems an inexplicable omission. May I point out that I responded to Joachim Neander’s article on Zisblatt here: http://revblog.codoh.com/2010/01/holocaust-scholar-finds-%E2%80%9Cfifth-diamond%E2%80%9D-to-be-a-work-of-fiction/ since I had already written a five-part expose on this woman, also published at Inconvenient History Blog. Here is Part One: http://revblog.codoh.com/2010/01/carolyn-yeager-a-special-jewel-in-the-genre-of-holocaust-horror-stories-part-1/ You can just follow on to the next 4 parts. Following my first response to Neander’s article, he wrote a reply. I then wrote a “Second Response to J. Neander” found here http://revblog.codoh.com/2010/02/second-response-to-j-neander/ By the way, I used the same documents Neander did, but I had already received them from Eric Hunt, with whom I was in regular contact at the time. There was only one valuable document that I didn’t have that Neander supplied, and I mention it where applicable. I leave it to the readers to decide who does the best job of determining whether Zisblatt deserves sympathy for anything, since almost everything she writes is a lie. These articles, and many more, can also be found at my personal website http://carolynyeager.net under My Articles. Waltzer IS a historian, head of the department at Michigan State University, with a PhD in History from Harvard. Why would he need to get another one (half-decent) to prove what he can’t prove??? Thanks in advance for all your answers. I recall the time when you were doing your research on Irene Zisblatt. You are far more astute than Neander, and more hard working. Nevertheless, I am amazed that Neander would trash the book of a woman who claims to be a Holocaust survivor. You can’t expect him to be as tough on Irene as you are. I read Black Rabbit’s comment as sarcasm. Waltzer is a historian, but he is a historian the same way as Harold Marcuse is a historian. Both of them have to go along with Holocaust claims that can’t possibly be true, in order to keep their jobs. What job does Neander have to keep? He always billed himself as an “independent scholar.” He supports the Holocaust Industry for reasons of his own, but he is not outwardly employed by anyone. He does damage-control, criticizing only that which is so over-the-top that it harms the credibility of the Holohoax in general (he wrote critically about the soap myth, for example) … in the same way Waltzer criticized the Rosenblats and their book. There is nothing amazing or surprising or admirable about it. They don’t stop being big holohoax supporters because of that. I still don’t take Black Rabbit’s comment about Ken Waltzer as sarcasm but only he can say what he really thinks. I also question his statement that “Neander proved Zisblatt’s case.” What did N. prove? Only that she was actually deported to Auschwitz with other Jews who were living in Hungary. The rest of her story is fiction. Now he seems to actually hope someone will prove Elie Wiesel’s case. Clarification is in order.